Tribhuvan University, Institue of Science and Technology published exam result of the first year second semester Statistics. We can find that result on the official site of TU also. M.Sc. Statistics first year second semester exam was held in Baisakh/Jestha. The result of Statistics Second Semester that we provide here also taken from the official site and place here with 2 option. You can view online or download this result. Check TU M.Sc. 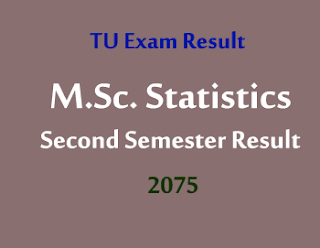 Statistics Second Semester Result and download option below.